Pursuant to Executive Order 98-01 on July 22, 1998 by former Governor George Bush, the Office of the Secretary of State was designated as the "Chief Liaison to Mexico and the Border Region of Texas". Additionally, as per House Bill 564 legislation and formal designation from Governor Bush, our Texas Secretary of State was also appointed as the "Border Commerce Coordinator" in 1999. In the context of these responsibilities, the staff of the Texas Border and Mexican Affairs Division has established a State Agency Advisory Roundtable on Border/Mexican Affairs ("Advisory Roundtable") for the purpose of identifying common inter-agency border concerns; it is expected that by this forum a common agenda will be developed which best advances the quality of life and standard of living in our border communities. Develop a profile of border and cross-border activities, initiatives and policies. The Advisory Roundtable meets on a quarterly basis. 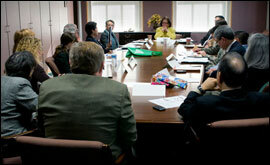 You can contact State agency representatives who participate in these Roundtable meetings.